D’fhógair www.foinse.ie inniu seoladh sraithe nua ar líne d’acmhainní foghlama saor in aisce do mhúinteoirí agus do dhaltaí Bunscoile i gcomhar le COGG (www.cogg.ie). Tá os cionn 200 acmhainn úrscothach, lena n-áirítear crosfhocail, póstaeir, cluichí, líon na bearnaí agus pleananna ceachta do mhúinteoirí, ar fáil anois saor in aisce ar líne ag www.foinse.ie. Tá na hacmhainní ar fad bunaithe ar théamaí curaclaim, a ligeann do mhúinteoirí ceachtanna iomlána a chur i dtoll a chéile leis na hacmhainní ar líne atá saor in aisce. Mar gheall ar éagsúlacht na n-acmhainní atá ar fáil ag www.foinse.ie tá rud éigin ar fáil do gach leibhéal cumais sa Ghaeilge. Ag tógáil ar cháil Foinse dá n-ábhar oideachais den chéad scoth, d’fhorbair múinteoirí bunscoile na hacmhainní seo do mhúinteoirí Bunscoile. Tá na hacmhainní oiriúnach do gach leibhéal d’fhoghlaimeoirí Gaeilge agus is féidir iad a úsáid in go leor réimsí den churaclam. I measc na n-acmhainní nua tá póstaeir dhaite tharraingteacha atá bunaithe ar théamaí laistigh den churaclam. Dearadh na póstaeir seo le go mbeidís éasca le húsáid ar chláir bhána idirghníomhacha agus le huasteilgeoirí, ach is féidir iad a chur i gcló freisin agus iad a úsáid i mbealach níos traidisiúnta. Tá cluichí idirghníomhacha, crosfhocail, míreanna mearaí agus ceachtanna líon na bearnaí ina gcuid den tsraith acmhainní freisin, a ligeann do mhúinteoirí freastal ar chumais éagsúla laistigh den rang céanna. Gach seachtain le linn an téarma scoile, foilseofar plean ceachta in Foinse (ar fáil leis an Irish Independent gach Céadaoin) a bhaineann leis na hacmhainní ar líne a thugann deis do mhúinteoirí agus do thuismitheoirí suim agus spéis a bpáistí sa Ghaeilge a chothú. Níl le déanamh chun tosú leis na hacmhainní ach dul go www.foinse.ie agus gliogáil ar ár dtáb ‘Acmhainní’ chun an réimse iomlán acmhainní atá ar fáil a fheiceáil agus tús a chur leis an spraoi sa seomra ranga. An Ghaeilge agus Cleachtadh Ealaín Comhaimseartha – deis iontach le dul i bhfiontar ar an nua? Ba mhaith linne fáilte is fiche a chuir chugat chuig ‘Fás agus Forbairt’, comhdháil a mhairfidh dá lá agus Duais-sparántacht Chruthaitheachta d’Ealaíontóirí. Mar ealaíontóir, léiritheoir nó mar láithreoir, tá súil againne go mbeidh spéis agatsa ann. Tá muid ag tnúth le go mbeidh níos mó ná ainm i‘Fás agus Forbairt’, tá súil againne go ndéanafaidh sé sin, smaointe a fhás agus a fhorbairt. Tá aidhm ag an gComhdháil: dul i ngleic le dúshlán nua atá romhain agus tacaíocht a thabhairt d’ealaíontóirí agus iad ag cruthú smaointe nuálacha úra. Táimid ag iarraidh ealaíontóirí le Gaeilge (agus dóibh siúd atá ar beagáin Gaeilge- is cuma má tá sé in úsaid agat nó nach bhfuil) a thabhairt le chéile chun dul i ngleic le saothar nua-aimseartha. Beidh taispeántais agus ceardlanna mar ghnéithe de ‘Fás agus Forbairt’ ó slua ealaíontóir atá ag obair trí mheán an Bhéarla, trí mheán na Gaeilge agus nó go dátheangach, anuas ar seo beidh seisiún le ceardlanna ealaíon agus laithreoirí le plé a dhéanamh ar conás a mbíonn na healaíontóirí agus lathreoirí in ann oibriú as laimh a chéile ar mhaithe le saothar nua a chumadh agus an lucht féácanna atá tuilte go maith ag an saothar nua seo a chruthú. Ca háit: Axis, Príomhsráid Baile Munna, BÁC 9. Clárúchán: Tá clárúchán anois ar oscailt. Ba bhreá linn dá mbeadh tú linn. Ba bhreá linn cloistéal uait! Is leabhar beag álainn do pháistí é ‘Sicín’. Tá scéal iontach ann faoi ghearrchaigh bheaga atá ar tí an nead a thréigean. Tá trí cinn de ghearrchaigh ann ar fad: Mattie, Jenny agus Tiny. Tarlaíonn na heachtraí sa scéal ar an Lá Speisialta a bhfuil na héin bheaga chun dul ag eitilt agus an nead a fhágáil don chéad uair ina saol. Is é Tiny laoch an scéil. Ceapann gach éinne nach bhfuil sé cróga go leor chun dul ag eitilt as a stuaim féin ach cuireann sé an dubh ina gheal orthu go léir! Is laochscéal beag deas é seo do pháistí san aoisghrúpa 4 – 8. Is scéal simplí, greannmhar deascríofa é faoi conas gur féidir snámh in aghaidh an tsrutha agus tá ceacht tábhachtach le foghlaim ann: is féidir le gach duine a bheith ina laoch sa saol má tá sé/sí cróga go leor. Tá an leabhar maisithe go hálainn le léaráidí deasa, daite ag Mary agus Emma Gilleece. Bheadh an leabhar seo an-oiriúnach sa rang do pháistí bunscoile san aoisghrúpa 4 – 8. Rugadh agus tógadh an t-údar Máiréad Mag Uidhir i Luimneach. Chaith sí a saol ag múineadh ina cathair dhúchais, ag teagasc leanaí le Riachtanais Speisialta i Scoil Naomh Iosaf i Lios na Groí ar dtús agus ina dhiaidh sin ar feadh tríocha bliain i Scoil Íde, Corrbhaile. Bhí uirthi éirí as an mhúinteoireacht sa bhliain 2009 nuair a fuair sí amach go raibh Seargadh Matánach Dromlaigh (MSA) uirthi. D’oscail Aire Stáit na Gaeltachta, Donnchadh Mac Fhionnlaoich, TD, Comhdháil faoin Léitheoireacht go hoifigiúil Dé hAoine seo caite, 21 Meán Fómhair 2012, in Ionad Comhdhála Marino i mBaile Átha Cliath. Is iad Foras na Gaeilge, an comhlacht Thuaidh/Theas atá freagrach as an nGaeilge a chur chun cinn a d’eagraigh an chomhdháil. D’fhreastail idir léitheoirí, scríbhneoirí, fhoilsitheoirí, mhúinteoirí, iriseoirí, léirmheastóirí, agus ionadaithe ó choláistí oiliúna agus ó institiúidí tríú leibhéal ar fud na tíre ar an gcomhdháil. Ag caint dó ag an oscailt, labhair an tAire faoin sult a bhain sé féin as leabhair a linne, cinn chlann Mhic Grianna agus Chathail Uí Shándair, mar shampla, a léamh agus a athléamh nuair a bhí sé óg. Mhol sé gur cheart an córas cuí a chur i bhfeidhm lena chinntiú go mbeidh deis ag léitheoirí an lae inniu, idir óg agus aosta, taitneamh a bhaint as an rogha leabhar den scoth, ríomhleabhair san áireamh, atá á bhfoilsiú ag foilsitheoirí na Gaeilge. San osradharc ar earnáil na leabhar a thug Seán Ó Coinn, Leas-Phríomhfheidhmeannach Fhoras na Gaeilge, agus sna cainteanna ó na foilsitheoirí éagsúla a bhí páirteach sa chomhdháil, léiríodh go bhfuil meánfhigiúirí díolacháin na bhfoilsitheoirí Gaeilge ag teacht le meándíolachán leabhair na bhfoilsitheoirí Béarla in Éirinn, rud a léiríonn go bhfuil neart léitheoirí Gaeilge ann agus go bhfuil siad sásta leis an rogha leabhar atá ar fáil. Ach mar sin féin, tá neart oibre le déanamh le níos mó béime a chur ar an scíthléitheoireacht nó ar an léitheoireacht mar chaitheamh aimsire taitneamhach seachas an léitheoireacht acadúil nó scoilbhunaithe. Tugadh le fios go bhfuil gá le cur chuige comhtháite i leith na meán i gcoitinne, agus i leith na poiblíochta agus na margaíochta, go háirithe, chun go mbeidh pobal mór na Gaeilge agus pobal na tíre trí chéile ar an eolas faoi na leabhair den scoth atá ar fáil i nGaeilge. Thug Rachel Van Riel, bunaitheoir agus Stiúrthóir Opening the Book, eochairchaint an-spreagúil uaithi. Labhair sí faoi choincheap fhorbairt an léitheora, agus ar na samplaí ar dhírigh sí orthu bhí feachtais léitheoireachta a d’eagraigh Opening the Book i dtíortha dhátheangacha amhail an Bhreatain Bheag agus an Iorua. Bhí Opening the Book ar thús cadhnaíochta san athrú meoin a tharla i leabharlanna na Breataine agus i dtíortha eile maidir le cothú na léitheoireachta, nó forbairt an léitheora, mar a thugtar air. Tá leabharlannaithe i ngach contae in Éirinn tar éis cúrsa oiliúna a dhéanamh faoi scáth Opening the Book. Thug duine d’eagraithe na comhdhála, Aedín Ní Bhroin, Stiúrthóir Chlár na Leabhar Gaeilge, an rannóg d’Fhoras na Gaeilge a bhíonn ag plé le foilsitheoireacht, scríbhneoireacht agus léitheoireacht na Gaeilge, le fios go raibh sí an-sásta le himeachtaí na comhdhála. “Bhí cainteoirí den scoth ann agus rinneadh plé oscailte ar na fadhbanna atá san earnáil. Ach, thar aon rud eile, léiríodh go bhfuil ardchaighdeán sna leabhair atá á bhfoilsiú agus gur trua nach bhfaigheann siad níos mó poiblíochta. Cuirfear moltaí a rinneadh ag an chomhdháil san áireamh nuair a bheidh straitéis don léitheoireacht á forbairt ag Foras na Gaeilge sna míonna amach romhainn. Seo chugaibh eagrán 119 d’ELeathanach-áis léitheoireachta do pháistí bunscoile i rang a 5 agus a 6. 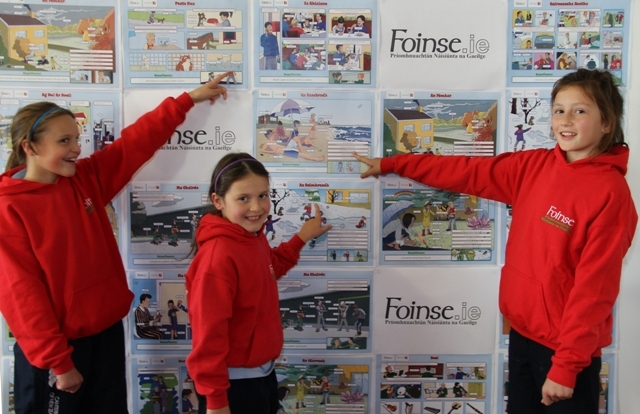 Tá an t-ábhar dírithe ar pháistí le Gaeilge mhaith acu sna gnáthscoileanna – scoileanna ina bhfuil an Ghaeilge mar T2. Ar ndóigh bheadh sé oiriúnach do pháistí ó rang a 4 ar aghaidh sna Gaelscoileanna agus scoileanna Gaeltachta chomh maith. Tá fáilte romhaibh ELeathanach a chur ar aghaidh chuig scoil ar bith eile nó cairde libh a mbeadh suim acu ann. Cuireann GAELSCOILEANNA TEO deontas d’imeachtaí idirscoile ar fáil do na scoileanna lán-Ghaeilge agus Gaeltachta. Bíonn an-tóir ar na deontais seo. Tugann na himeachtaí idirscoile seo deis thábhachtach do na scoileanna lán-Ghaeilge agus Gaeltachta nasc a chruthú le scoileanna eile. Ó thráth na gceist go cluichí peile, spreagann na himeachtaí ilghnéitheacha seo cumarsáid agus spraoi trí mheán na Gaeilge, rud a théann chun leasa na scoile, chun leasa na ndaltaí agus chun leasa an scoilphobail. Tá gach eolas mar gheall ar an scéim seo ar fáil ach ríomhphost a chur ag oifig@gaelscoileanna.ie nó glaoch a chur ar 01 8535193. Tá an scéim deontais seo á maoiniú ag Foras na Gaeilge. Is beag duine atá ábalta a rá gur shnámhadar timpeall ar Éireann. Go dtí anois. Is eagraíocht é TACA a chuireann tacaíocht ar fáil don Ghaelscolaíocht ó thuaidh agus déanann AITHEANTAS amhlaidh ó dheas. Tá an dá eagras ag obair as láimh a chéile le tamall leis an Snámh mór a reachtáil agus an dúshlán seo a fhíorú do rannpháirithe an tsnámha. Shnámh an grúpa 5 nóiméad amach ó gach contae sa tír a bhfuil cósta aige. Bhí 17 contae san iomlán i gceist; Cill Mhantáin, Loch Garman, Port Láirge, Corcaigh, Ciarraí, An Clár, Gaillimh, Maigh Eo, Sligeach, Liatroim, Dún na nGall, Doire, Aontroim, An Dún, An Lú, An Mhí agus faoi dheireadh Baile Átha Cliath, agus níor thóg sé ach dhá lá. Bailíodh roinnt airgid agus tá an lucht eagraithe an-sásta leis an spórt agus spraoi a bhain leis agus leis an toradh iontach deireannach. Bhí Pat Ó Cianáin mar bhall de TACA agus bhí Marcas Mac Ruairí agus Lorcán Mac Gabhann mar bhall de AITHEANTAS. Bhí Sarah de Búrca ó Meon Eile ansin chun triail a bhaint as an Snámh í féin.